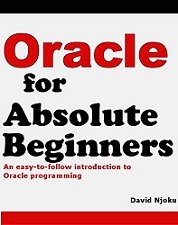 This book, which began life as a hugely popular series of articles on the All Things Oracle site, introduces the reader to Oracle programming, from SQL and PL/SQL to the more academic subjects of database design, normalization and the characteristics of an effective developer. Aimed at absolute beginners, with no background in programming - Oracle or otherwise - this book seeks to break down complex subjects with light-hearted and relatable examples; an approach that is close to unique amongst Oracle textbooks. It is to teach beginners how to use Oracle to store, retrieve, manipulate and process the data. This book start with fundamentals of relational database management system and goes upto advanced topics such as native dynamic sql, etc. It covers core database essentials. David Njoku has worked as an Oracle database and applications developer since the turn of the millennium, holding key positions in national and multinational corporations, and often working on touchstone government projects. He has been active for a number of years as an expert contributor for a number of technical forums, and has gained a following for his in-depth but light-hearted style of writing.